Silent era directors had a particular fondness for stories set in rural America, which many of them had experienced firsthand and which in many ways was still alive and well. They recreated the humble details of growing up “on the farm” where the “home folks” had lives of quiet, dignified routine and honest hard work. They lovingly captured picturesque towns where barefoot boys played marbles in front of the general store and where the arrival of a train was an event. In the realm of silent comedy, where anything and everything was up for satire, “rubes” were spoofed ad infinitum–with an undercurrent of amused affection. Tol’able David blends this nostalgia with a simple, powerful dramatic story touching upon universal themes. Young David Kinemon lives on a peaceful Virginia farm with his honest, close-knit family. He longs to be seen as manly as his older brother Allan, who has the important job of being the U.S. mail carrier for their town. But his mother gently tells him, “You won’t be a man for a spell yet, David, but you’re tol’able…just tol’able.” Their way of life is threatened after three loutish outlaws move into the area, terrorizing them and causing several tragedies. Eventually, in one of the greatest climaxes in silent cinema, David overcomes the odds to defend the honor of his family and to prove himself a man. When you watch Tol’able David—or, should I say, experience it–you’re not only watching an engrossing story but are sharing in King’s memories of country life. The scene of the Kinemons kneeling and praying together before bedtime was straight from King’s past. He warmly captures the Virginia mountains, valleys, barns and worn wooden fences he knew so well. We see young David playing the harmonica and the neighbor girl Esther driving the family cow home. The film is steeped in nostalgia–a nostalgia that feels true, not merely sentimentalized. It’s also beautifully paced, the first quarter or so simply capturing David’s life on the farm and his interactions with his friends and neighbors (and adorable dog Rocket). There’s a comic undertone to his desire to prove how “manly” he is–Esther at one point teases him, saying “You’re right tol’able…for a boy.” The sensitive Barthelmess–who was in his mid-twenties at the time–carries the film beautifully, and the girl-next-door Gladys Hulette is his ideal complement. King was sparing with his title cards, letting the cinematography and character interactions “speak” for themselves. We find ourselves relaxing, letting ourselves be pulled into this bucolic late 19th century world. You can almost smell the meadow grass, warm in the sun. When the crude, bullying Hatburns move into the area, it feels genuinely disquieting–Evil slithering into Eden. And when tragedy strikes, it comes as a true shock. The immensely unjust misfortunes that befall the Kinemans are meant to hit us hard, and for me, they certainly do. The pastoral is a form of nostalgia, the longing of one caught up in the complex life of the metropolis for a simpler time. Rural life is the essential subject of the pastoral, as a biographer of Frost has written, or–to quote the Oxford Companion to English Literature–“the essence is simplicity of thought and action in a rural setting.” And so it was in Virgil’s Arcadia and Shakespeare’s Arden. Tol’able David…may be the most perfect film example of the form. Coppedge discusses the other great depths of the supposedly “simple” story. The little vignettes of life on the Kinemon farm are part of a tradition hearkening all the way back to the ancient Greek idylls, and David’s struggle with the Hatburns is explicitly linked to the Biblical tale of David and Goliath. David himself is an archetypal pure young hero who must overcome great obstacles in order to ultimately triumph over evil. Then there is the concept of “honor,” important in those olden days and central to Tol’able David. An early intertitle tells us that Hunter Kinemon, David’s father, “kept the biblical tradition of a family united by every tie of love and honor.” “Honor” has become a foreign concept to many of us today, but in the Kinemons’ world, it has the utmost importance. Tol’able David, which was remade in 1930, probably could not be remade successfully today (not that I would really want to see such a thing). Period details could be researched, I suppose (would the mother be shown standing and shooing away flies as her family eats? ), and surely the drama at least would appeal to some directors. (The Coen brothers did an awfully good job with True Grit, after all.) But it would have to draw on paper and electronic sources, in a time when the majority of those who personally experienced some semblance of pre-electricity country life are in their graves. It would be a recreation based more on our broad, nonspecific idea of the “olden days” in America, and would not have that same ring of authenticity. But that makes great films like Tol’able David all the more precious. They tap into something deep. For even today people will recall with pride how one great-grandfather used to drive an ice wagon, or how a great-great-aunt used to make handmade lace, or how their ancestors still used horse-drawn plows on the family farm right up until the mid-1930s. Myself, when I visit the countryside where I grew up, and see an ancient tipsy barn with its fading red paint or the rusted ruins of a model T whiling away the decades in an old pasture, I’ve come to feel that they are relics. They are tangible reminders of the humble time of True Heart Susie, A Romance of Happy Valley, Keystone clowns in “rube” costumes–and above all, Tol’able David. Gish, Lillian, with Ann Pinchot. The Movies, Mr. Griffith, and Me. San Francisco: Mercury House, 1969. This entry was posted in Thoughts on Films and tagged 1920s, Americana, Gladys Hulette, Henry King, Richard Barthelmess, silent drama, Tol'able David by Lea S.. Bookmark the permalink. Beautiful piece. Henry King was an extremely versatile director, but foremost I consider him the “king” of Americana. That’s a title he definitely earned! Thanks for reading, Patricia. My main association with this film is its inclusion in the climax of “The Tingler” with Vincent Price. One of these days, I’ll watch the rest of it! My friend’s father (who was also our scoutmaster!) 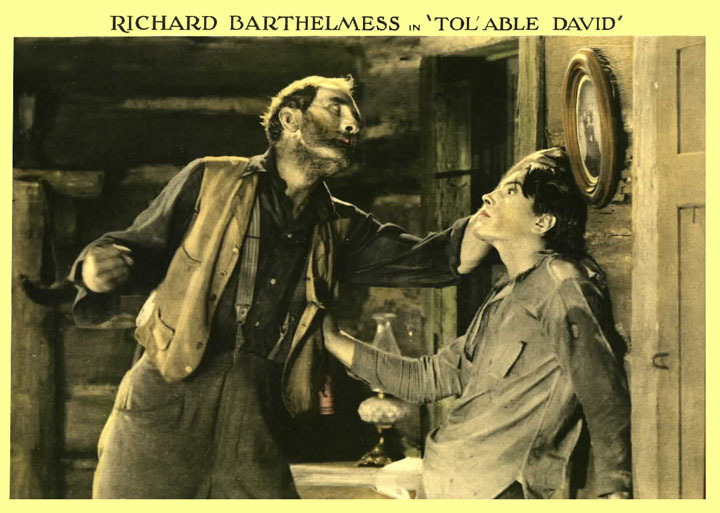 was in Henry King’s The Gunfighter, thirty years or so after Tol’able David, in an adolescent ‘village idiot’ role. He thought highly of Mr King, Gregory Peck, and Karl Malden.